Following a recent decision issued by Judge James Donato of the U.S. District Court for the Northern District of California, a jury to be convened in San Francisco in July will decide whether a Facebook artificial intelligence technology creates regulated “biometric information” under Illinois’ Biometric Information Privacy Act (BIPA). In some respects, the jury’s decision could reflect general sentiment toward AI during a time when vocal opponents of AI have been widely covered in the media. The outcome could also affect how US companies, already impacted by Europe’s General Data Protection Regulation (GDPR), view their use of AI technologies to collect and process user-supplied data. For lawyers, the case could highlight effective litigation tactics in highly complex AI cases where black box algorithms are often unexplainable and lack transparency, even to their own developers. What’s At Stake? What Does BIPA Cover? Uniquely personal biometric identifiers, such as a person’s face and fingerprints, are often seen as needing heightened protection from hackers due to the fact that, unlike a stolen password that one can reset, a person cannot change their face or fingerprints if someone makes off with digital versions and uses them to steal the person’s identity or gain access to the person’s biometrically-protected accounts, devices, and secure locations. The now 10-year old BIPA (740 ILCS 14/1 (2008)) was enacted to ensure users are made aware of instances when their biometric information is being collected, stored, and used, and to give users the option to opt out. The law imposes requirements on companies and penalties for non-compliance, including liquidated and actual damages. At issue here, the law addresses “a scan” of a person’s “face geometry,” though it falls short of explicitly defining those terms. Facebook users voluntarily upload to their Facebook accounts digital images depicting them, their friends, and/or family members. Some of those images are automatically processed by an AI technology to identify the people in the images. 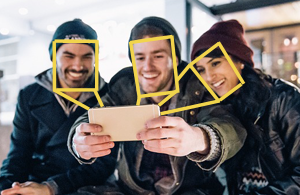 Plaintiffs–here, putative class action individuals–argue that Facebook’s facial recognition feature involves a “scan” of a person’s “face geometry” such that it collects and stores biometric data in violation of BIPA. Digital images contain a numerical representation of what is shown in the image, specifically the color (or grayscale), transparency, and other information associated with each pixel of the image. An application running on a computer can render the image on a display device by reading the file data to identify what color or grayscale level each pixel should display. When one scans a physical image or takes a digital photo with a smartphone, they are systematically generating this pixel-level data. Digital image data may be saved to a file having a particular format designated by a file extension (e.g., .GIF, .JPG, .PNG, etc.). A deep convolutional neural network–a type of AI–can be used to further process a digital image file’s data to extract features from the data. In a way, the network replicates a human cognitive process of manually examining a photograph. For instance, when we examine a face in a photo, we take note of features and attributes, like a nose and lip shape and their contours as well as eye color and hair. Those and other features may help us recall from memory whose face we are looking at even if we have never seen the image before. A deep neural network, once it is fully trained using many different face images, essentially works in a similar manner. After processing image file data to extract and “recognize” features, the network uses the features to classify the image by associating it with an identity, assuming it has “seen” the face before (in which case it may compare the extracted features to a template image of the face, preferably several images of the face). Thus, a digital image file may contain a numerical representation of what is shown in the image, and a deep neural network creates a numerical representation of features shown in the digital image to perform classification. A question for the jury, then, may involve deciding if the processing of uploaded digital images using a deep convolutional neural network involves “a scan” of “a person’s face geometry.” This question will challenge the parties and their lawyers to assist the jury to understand digital image files and the nuances of AI technology. For Litigators, How to Tackle AI and Potential AI Bias? The particulars of advanced AI have not been central to a major federal jury case to date. Thus, the Facebook case offers an opportunity to evaluate a jury’s reaction to a particular AI technology. In its summary judgment brief, Facebook submitted expert testimony that its AI “learned for itself what features of an image’s pixel values are most useful for the purposes of characterizing and distinguishing images of human faces” and it “combines and weights different combinations of different aspects of the entire face image’s pixel value.” This description did not persuade Judge Donato to conclude that an AI with “learning” capabilities escapes BIPA’s reach, at least not as a matter of law. Whether it will be persuasive to a jury is an open question. It is possible some potential jurors may have preconceived notions about AI, given the hype surrounding use cases for the technology. Indeed, outside the courthouse, AI’s potential dark side and adverse impacts on society have been widely reported. Computer vision-enabled attack drones, military AI systems, jobs being taken over by AI-powered robots, algorithmic harm due to machine learning bias, and artificial general intelligence (AGI) taking over the world appear regularly in the media. If bias for and against AI is not properly managed, the jury’s final decision might be viewed by some as a referendum on AI. For litigators handling AI cases in the future, the outcome of the Facebook case could provide a roadmap for effective trial strategies involving highly complex AI systems that defy simple description. That is not to say that the outcome will create a new paradigm for litigating tech. After all, many trials involve technical experts who try to explain complex technologies in a way that is impactful on a jury. For example, complex technology is often the central dispute in cases involving intellectual property, medical malpractice, finance, and others. But those cases usually don’t involve technologies that “learn” for themselves. How Will the Outcome Affect User Data Collection? The public is becoming more aware that tech companies are enticing users to their platforms and apps as a way to generate user-supplied data. While the Facebook case itself may not usher in a wave of new laws and regulations or even self-policing by the tech industry aimed at curtailing user data collection, a sizeable damages award from the jury could have a measured chilling effect. Indeed, some companies may be more transparent about their data collection and provide improved notice and opt-out mechanisms.